Have you seen movie The Quest For Fire (1981)? It features a group of prehistoric humans trying to re-acquire fire after they lost it in a battle. Their language is rudimentary and they mostly act like beasts. Although the movie claimed—not without some controversy—to reflect the research of the time, it was based on a novel written by J.-H. Rosny in… 1909! By and large, the perception of archaic humans had barely changed in seventeen years. Maybe this helps to put in perspective the progress historians have made in the past decades: we discovered ourselves several cousins, such as the Denisovans, and we discovered that most modern humans carry a small amount of Neanthertalian DNA. The sad part is that very little of all of those exciting and stunning findings made it to public knowledge. This is why I appreciate so much this new book by Claire Cameron. Setting a story during the Paleolithic Period and imagining a Neanderthal as a main character was a daring, risky, and fabulous idea which I really want to salute here. 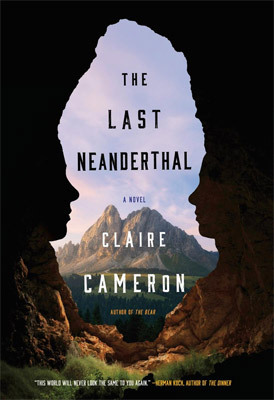 In a nutshell, The Last Neanderthal relates two parallel stories: one imagines the life of a female Neanderthal, called Girl, who has seen the population of her kind dwindle over the years and whose family is facing life-threatening challenges. The other is about a pregnant archaeologist in modern time who just excavated the remains of this same Neanderthal woman. To be honest, I wish this book had just been about Girl, the Neanderthal. It was very original and refreshing, and by far the best-executed part of the book. Cameron pulls you in this ancient world where Nature defines and dominates everything, and where humans had no choice but to fully be part of it. You feel right there, beside Girl, sniffing the wind for threat or food, gazing at the sky for information, and appreciating the warmth and safety provided by her small family. I also particularly enjoyed how Girl was trying to make sense of the dynamics within her family with her limited intellect but acute instincts. This ability of immersing the reader into her world, especially into the wild, is something Cameron had already shown she excels in with her previous novel The Bear. When Girl peeked her head out of the hut that morning, she could smell the struggle of spring. It was the first day of the hunt and the land had come alive. The sun worked hard to peel the winter ice away from the earth. As it did, it uncovered a deep hunger in the land. The same kind of craving lived in the bellies of all the beasts who roamed the valley of the mountain. Girl watched as the trees below swayed with worry. They could feel the vibrations from the growling bellies through the soil around their roots. Cold air clung to the pine needles and each sprouting cone at the end of each branch quivered in anticipation. The ground shifted in discomfort as the ice let it go. Spring brought life for some, but it brought death for others. It was incredibly easy to empathize with Girl. Cameron made her very accessible to us and manages to create a sense of connection with this extinct branch of the human family. She made Girl’s growing feeling of loneliness terribly easy to relate to, so much that we can even feel sadness and regret that we’ll never know what Neanderthals could have developed into. What would the world look like if they had survived to share it with us today? Unfortunately, the other character in The Last Neanderthal, the archaeologist Rosemund Gale, was a disappointment. First, I expected a more realistic depiction of pregnancy rather than a series of simplistic clichés: the throwing up, the inconvenience of baby bumps, and the uncontrollable mood swings. Pregnancy, like sickness, is one of those experiences that reminds us humans are still subject to Nature: we can’t choose how a pregnancy unfolds. However, Gale seems in complete control: in particular, she decides to overwork till the birth, as if it was just a matter of will. This was grating. It was Tuesday and I had promised Simon that I would have the baby on the weekend. I was left to wonder what I should do with my free time—not something I was accustomed to having. I had declined a birthing course, as it was nothing I couldn’t learn from a book. Another sore point was the (absence of) relationship between Gale and the little individual growing in her belly. There is much talk (rant?) about the pregnancy, but hardly a thought about the baby. Gale’s experience was dry, cold and terribly practical. Finally, I didn’t like how the role of the father was dismissed, if not denied: Gale keeps pushing her boyfriend away, even though she definitely needs help, and the baby a father. She shuts him off their pregnancy and doesn’t mind the prospect of giving birth in another country, even though it could easily be otherwise. Contrary to Girl, Gale made herself alone. I just found her obnoxious and selfish. All this being said, I would recommend The Last Neanderthal for its originality. I wish more books could make me travel like this one. Girl is a fabulous character, her story is frankly epic, and I loved imagining her surrounding, feelings, and way of thinking. I can only commend Cameron for making us feel a connection with such ancient ancestors. The book wasn’t perfect, but it is definitely special and deserves attention. I loved The Bear. And I like reading about Neandethals/evolution. So I don’t know why I haven’t read this yet. Great review! I thought the way that Girl’s perspective comes off the page for us, as readers, was remarkable. The ways in which her view of the world both contrasted and compared with our own? It was just perfect for us to almost-nearly-kinda-completely-wholly “get it”. Our world, but not our world. I’m a fan of dual narratives like this one to start with, but I also didn’t find the modern-day character frustrating in the same way that you’ve described. Maybe because I felt she was supposed to be that way, that we were intended to feel that she had lost touch with some important and elemental truths? Overall, I’m not sure that I’m a perfect match for what CC does on the page, but I do admire many aspects of her storytelling a great deal!